7 years in the UK, France and the USA. Myself. I realised I needed to do something to get fit as I wasn't sporty at all in school so when I started college I realised I need to do something to get fit. So started with running as I didn't have a clue what I was doing in the gym and was embarrassed to go alone. So one morning I went running and fell in love. Then I started going to the gym with friends and realised I loved working out and learning what it took to be healthier. It all started from there reall... I did my personal training course as soon I finished my fashion and design diploma. Throughout my career I have always been more personal training and sports therapy focused rather than class based. Although I do teach spinning, core, yoga, circuits, bokwa and aerobics too. I love yoga both teaching and practicing and think it complements my running so well. What do you like about working in fitness? My favourite part is having a job that's always different. I'm never doing the same thing and I'm always on the go. I love being active and keeping fit and my job allows me to do that. It never ever feels like I have a job or have to go to work as fitness and helping people are my two favourite things. Definitely helping people reach their goals. It's so rewarding seeing people not only loose the weight they wanted to but the see them change as a person. They feel so much more comfortable and happier within themselves. It's the best feeling ever. What do you most like about running? I love everything about it. 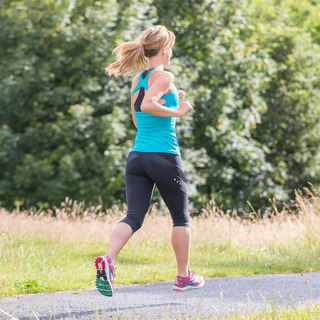 I love that you can use it in so many way... you can just throw your trainers on and run by yourself - it can be your time to block all your troubles out and have some time alone. I love that you can use it socially by running in races or running as a club or with friends - it's a great way to meet new people. And I love it because you can constantly challenge yourself by taking on new personal or race challenges to constantly push boundaries and limits. what are you enjoying most about training so far to date? I'm enjoying getting everyone out their and inspiring others to either take up running or some form or exercise. Thats a hard question, there are so many places I love. I'd have to say here in Manchester though. There is so much to do and see. It's also not that big, so it has a real sense of community where your constantly bumping into people. It has easy access to everywhere too which is great plus the peaks are only on our doorstep. I also love the fact that there are so many cool surrounding town - you never get bored here. What else sport wise do you enjoy? I always enjoy trying new things, I really want to try acro-yoga as well as body combat, spinning and barrecore. I love quinoa and most fruit, especially strawberries. Favourite part of your body and why? Probably my legs because they are strongest part and have got me through a hell of a lot of miles. Body part you enjoy working on other people? All over, I like using functional exercises while training as they work so many muscle groups. Something that annoys you about what people think about training? That you can't touch carbs, your body needs carbs to fuel the body! Especially when you are doing a lot of training, it's just knowing what the good carbs are. For example, sweet potato, wholemeal pasta, brown rice and quinoa are all great sources.